Professor Peeters is Director of the Institute for Health Transformation and Professor of Epidemiology and Equity in Public Health at Deakin University. She is Past President of the Australian and New Zealand Obesity Society and sits on national and international advisory boards and steering committees. In 2014 she was awarded the prestigious World Obesity Federation Andre Mayer Award for research excellence in obesity and a Churchill Award for innovative work in equity and population prevention. Professor Peeters graduated with a PhD in Virology from the University of Melbourne in 1997, then held research positions at Monash University, Erasmus MC (the Netherlands), and the Baker Institute, before commencing at Deakin University in 2015. 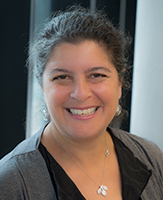 She held the positions of Associate Director of the Global Obesity Centre and Deputy Director Centre for Population Health Research within the School of Health and Social Development before her appointment as Director of the Institute for Health Transformation in 2018. A public health researcher, she is particularly interested in the provision of information to facilitate objective and equitable choices in public health by policy makers, practitioners and the public. Read more about Professor Peeters’ work.